Has your cat been suffering with diarrhea, vomiting, lack of appetite or weight loss? These can all be signs of Irritable Bowel Syndrome in cats (feline IBS) and should not be ignored. For some cats with IBS, the symptoms appear when they are young kittens but many times, it appears in older cats. This can be frustrating and shocking to the pet parent as often there have been no diet changes. Pet owners may report that their cat “has been eating the same food for years without a problem”. This is because inflammation builds up and the symptoms might be more subtle when the pet is younger. The first step for natural IBS Relief is to change your cat's diet. Just because your pet might “like” a food does not mean it is good for them. Most likely the pet food contains too many starchy carbohydrates such as rice, peas, grains and cats as natural carnivores do not need this in their diets. Your cat may have a food allergy to certain commonly used proteins such as fish and poultry. It's important to find a low carbohydrate, hypoallergenic diet to help relieve your cat's IBS symptoms. While some cats may initially resist a diet change, with patience and a lot of options, you will find something better that your kitty will accept. Using cat IBS natural remedies in conjunction with a diet change can provide much relief for your cat’s intestinal discomfort. The IBD kit, which contains cat IBS natural remedies that target the symptoms and causes of IBS and the Gastro ULC a natural remedy that coats the stomach and helps with acid reflux which is common with vomiting, can offer a great deal of relief. 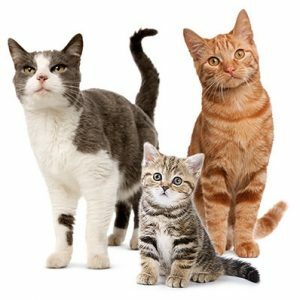 IBD Kit--This kit includes 3 unique formulas that have been specially formulated for IBD and used successfully to help cats with inflammatory bowel disease. The Kit includes Power Probiotic, Soothing Digestive Relief and Notatum Anti-Inflammatory Drops. When a pet has severe IBD, it is necessary to use a combination of formulas because they work differently to help reduce the symptoms and repair the intestinal lining. We have seen many cats especially improve using these three formulas together. Probiotic--it is important to use a multi-strain, powerful Probiotic that has been used extensively with cats that have IBD. Most probiotics are not manufactured in such a way so that they can survive the stomach acid, let alone a hot day. Power Probiotic for Pets is easy to administer, very effective and well tolerated by cats and dogs. The product has been third-party tested and guaranteed to contain the amounts of friendly bacteria indicated on the label. Soothing Digestive Relief for Pets is a gentle formula that has helped thousands of cat and dog owners to finally stop the diarrhea. It contains herbs to ease indigestion and discomfort. Gastro ULC--this works as a natural "Pepto Bismol" for pets. It is very effective in reducing the pain of acid stomach, helping to reduce inappetance and reflux.